Welcome to the Handheld Press! Handheld Press sells stories, handpicked stories from the past and the present, because they are remarkable and wonderful. We publish the novels that we can’t put down, and the stories we want to give to our friends as presents. Handheld Press books are beautiful objects, designed and laid out with care. We hope you’ll think so too. We filmed seventeen clips of Kate talking about each one of our books, and the links to our new YouTube channel will be going up on each book page as fast as our editor can post them. We have bags. Bags and bags of them. Each order of two or more books gets a free bag. And they’re really nice: see their photo here. 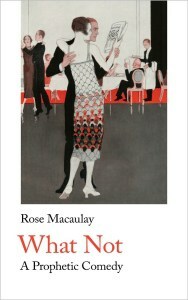 The Guardian described our edition of Rose Macaulay’s What Not as ‘a lost feminist classic that anticipated Brave New World‘, and we published it on 25 March 2019. You can order it here. We’ve had to reprint it twice before the publication day, so high has been the demand. Zelda Fitzgerald, wife of the very much more famous F Scott, wrote one novel, and we republished it on 14 January 2019. Save Me The Waltz covers the same ground as Tender is the Night (and we think it’s so, so much better). Order it here! We are delighted to be able to offer a 25% discount and bulk delivery for book groups: contact us with the number of books you’d like to order, and where to send them, and we’ll let you know the total price. You send us the money by PayPal, we cycle to the post office with your box. Easy! We were profiled by Shiny New Books: read all about the secrets of the Handheld editing zone, and what fuels our energy. Have a Handheld Press Book Party! If you live in or near Bath & Bristol, and have a hankering for a party for your friends and neighbours, have a Handheld Press Book Party! We will entertain you and your guests for up to an hour with stories about the books that we publish, some readings from the best bits (suited to your interests), and then you can browse and buy at discounted prices. Interested? Please email us to talk about it. It’s a free service, and makes a great book-minded party. We’ve also set up a book group: the 20thC Book Group is for readers in the Bath area, reading a fine novel from a different decade of the 20thC each month at the Beaufort Bookshop. Find out more here. We’re reviewing the accessibility of our books: see Terms and Conditions for more information. Use Visa with PayPal to shop! You can buy our books directly from this site using PayPal, and that includes credit cards too. When ordered directly from this site, each book comes with its own special bookmark. All our books are available as printed books, and as ebooks. Click on the book cover images to go straight to their ordering page, or use the menu at the side. We also offer gift wrapping and despatch so you can send presents directly: please look at our Ordering and Delivery page for details. Want to talk to us about publishing your story? Please go to the Authors page, and tell us about your project. We’ve organised the Handheld Press into three lists. Handheld Classics are reprints of excellent forgotten fiction, novels and stories that deserve a second life. Each Classic has an introduction written by a expert in plain English, and extremely useful notes on the text. Handheld Research tells stories that come out of research passions. Scholars and enthusiasts spend years working on their special subjects to create remarkable, handcrafted stories for you to read. Handheld Modern books are modern stories about the present and the future. Science fiction, letters, even historical fiction, and visions of the future. Each of the Handheld books is a marvellous story: we guarantee it. Explore the lists — Classics, Research and Modern — or use the search button for the name you’re looking for. Choose one for yourself and one for a friend. Choose more than one, go on.